Total eco Management (TEM) is a Sustainability Consultancy. Total eco Management Limited are the first Global Reporting Initiative (GRI) Certified training provider in the United Kingdom and the first GRI Certified Training course to be accredited by the Institute of Environmental Management & Assessment (IEMA): We are offering an internationally recognised, Award Winning, comprehensive two-day GRI Certified Training Programme: Sustainability Reporting with the Global Reporting Initiative. With diverse backgrounds and areas of expertise TeM’S core group of GRI Nominated Trainers are committed to providing the highest level of instruction to all who attend our training events. All Trainers are fully approved. Quality control and quality assurance by the Global Reporting Initiative insures our programme meets the highest standard demanded to deliver the internationally recognised training programme. The course is designed to support both new and experienced reporters to prepare and review your reporting process. 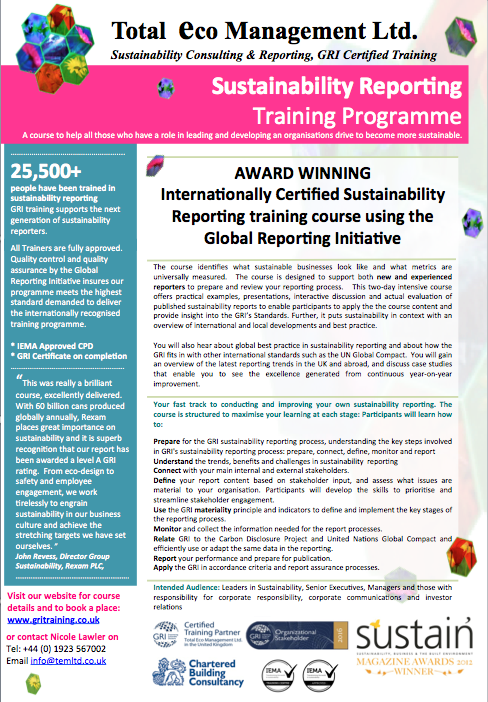 This two-day intensive course offers practical examples, presentations, interactive discussion and actual evaluation of published sustainability reports to enable participants to apply the the course content and provide insight into the GRI’s reporting framework. Further, it puts sustainability in context with an overview of international and local developments and best practice. You will also hear about global best practice in sustainability reporting and about how the GRI fits in with other international standards such as the UN Global Compact. You will gain an overview of the latest reporting trends in the UK and abroad, and discuss case studies that enable you to see the excellence generated from continuous year-on-year improvement. Total eco Management Limited will provide relevant and meaningful case study examples and extensive reporting expertise to deliver regionally appropriate advice and guidance on reporting practices. The GRI will provide you with a certificate on completion of this course. The prevalence of sustainability reporting is growing and much of it is converging around the use of the GRI’s sustainability reporting process and GRI G4 & the new GRI Standards released 19 October 2016. GRI is the most widely adopted non-financial reporting framework in the world and is used to help communicate sustainability performance and encourage transparency and accountability. GRI’s Framework is used by leading financial markets institutions like Bloomberg, NASDAQ and Thompson Reuters as the basis of their respective environmental, social and governance (ESG) information offerings. It is also increasingly used by governments and stock exchanges as a reporting requirement. Ten governments (Austria, Belgium, Canada, Denmark, Finland, Germany, Netherlands, Norway, Sweden, United States) have a formal reference to GRI in their governmental corporate responsibility guidance documents and/or policies. Connect with your main internal and external stakeholders. Define your report content based on stakeholder input, and assess what issues are material to your organisation. Participants will develop the skills to prioritise and streamline stakeholder engagement. Report your performance and prepare for publication. How does a GRI sustainability report add value to my organisation? How do I prepare properly for a robust GRI sustainability report from start to finish? What should I include in my GRI sustainability report? What data should I be using in the GRI sustainability report? How do I engage stakeholders? What are the trends, benefits and challenges in GRI sustainability reporting? A comprehensive two-day Award Winning, GRI Certified Training Programme. A central place to unlock a wealth of sustainability & Integrated reporting information. Register your report or Search TODAY! 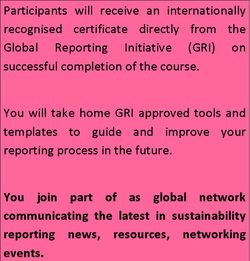 we are offering an internationally recognised comprehensive two-day GRI training course: Sustainability Reporting with the Global Reporting Initiative (GRI).
" 93% of CEOs say that sustainability will be critical to the future success of their companies." We are a registered Organisational Stakeholder of the Global Reporting Initiative (GRI) and support the mission of the GRI to develop globally accepted sustainability reporting guidelines through a global, multi-stakeholder process. The Global Reporting Initiative (GRI) drives sustainability reporting by all organizations. GRI produces the world’s most comprehensive Sustainability Reporting Framework to enable greater organizational transparency. 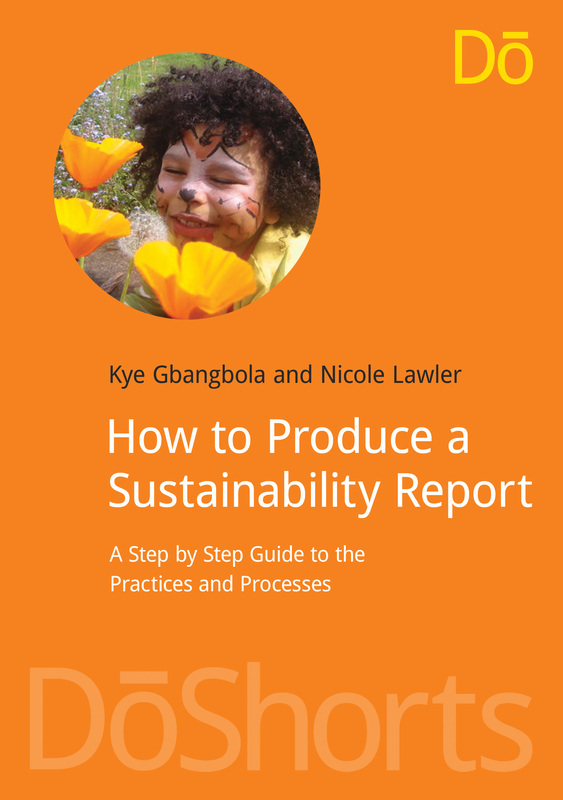 The Framework, including the Reporting Guidelines, sets out the Principles and Indicators organizations can use to measure and report their economic, environmental, and social performance. GRI is committed to continuously improving and increasing the use of the Guidelines, which are freely available to the public. Copyright © 2002 - 2019 Total eco Management Limited. All Rights Reserved' on the site. Total eco Management Limited is not responsible for the contents or reliability of the linked websites and does not necessarily endorse the views expressed within them. Listing shall not be taken as endorsement of any kind. We cannot guarantee that these links will work all of the time and we have no control over availability of the linked pages. All explanation text on this page was taken from the linked websites.